I read the Arc of this book and have reread it just read it again. I loved it. What a beautiful love story. 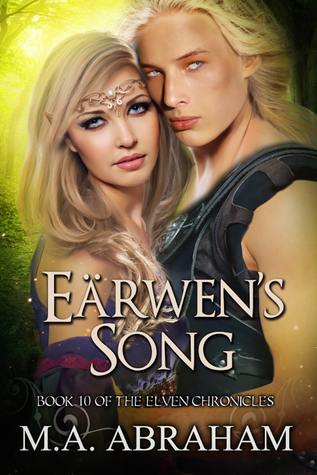 Earwen and Eol are so suited to each other . Have loved both these characters in each book they have been in. Knowing how strong these two are should have known their coming together wouldn't be easy. Eol bound them to each other in the Ancient way and it is a very strong bond. The death of one means the death of the other. So many of my favorite character are in this book with them. This was also a much more serious story as they are heading into war with their enemy the Demons again. The battle scenes were exciting and in three of the Elven Kingdoms and bring into beng Eden and Gabriel's son's both very capable warriors. Also the losses that war causes has started to happened in this book. As usual Ms. Abraham has a lot of twists and surprises, I truly loved it and hated that this book brings on the journey to the end of this series over the next two novels and one novella. Do yourself a favor and give this whole series a read I love it. Another powerful book. In this book two strong well-known Elves has bonded in the way of the ancients. Stronger and riskier bond but special. Not recommended during war times. The battle between the Demons and the Elves wages on and has continued in earnest in this book. No matter how many times the Elves cut their numbers in half, more Demons pours out of the mountains. Discoveries were made by Eol that ancient weaponry can destroy the Demons in a way their weapon couldn't. A huge improvement in the Elven army. Gabriel Eagle Claw, the General of the Elven Empire has given the reigns to his two sons to become a General in other kingdoms. His two sons proved to be strong Generals like their father in this book. This story showed the Elven Chronicles is taking a darker turn as lands are sinking in some parts of the Elven Empire and the war that is never ending. It was thrilling to read this book. A major loss was in this book as well but I think the Elven Empire will be alright. I absolutely enjoyed reading Eol and Earwen's story. Looking forward to Larien's as she seemed determined to finally end the Demons using her Dragonets. This story is vying for first place with "Return of the Legend", book 5, for me. I'be been wanting to read Eöl's story from the time he appeared in the series, larger than life warrior, protector, with a dry sense of humour that made me crack up. I am glad fate choose Eärwen for his Life Mate. She was in the shadows of her sister for too long, a sweet girl growing up, now a beautiful, soft-hearted, loyal, brave young woman. Their journey to HEA is wrought with danger, separation, tears (make sure you stock up with tissues), but even the distance could not keep them apart. Their souls were connected in the most ancient way and that is what saved them both... and the swift intervention from Eärwen's friend, Larien LOL good, because I was ready to smack Eöl myself, even though I love him dearly. The story is lightened by the signature humour of the author thrown in at times that I could not help but laugh out loud. I hope you will take the journey with them, it is worth it.